So you’re moving to London. Jolly good. Naturally, you’ll want to take the whole family, including the 4-legged members. How do you ensure your pets will make the trip safely and with as little stress as possible? Research – aside from learning what documentation you’ll need (see below), where do you get the documents? Who can fill them out? What do you do with them? Create a calendar – you’ll want to plot a timeline for all the documentation you’ll need and other tasks that must be accomplished, as it can get complicated and certain things have to be done in a certain order. Visit your veterinarian – your pet may need a physical exam or rabies booster, and if your pet is a dog they will definitely need specific tapeworm treatment before then can go to London. Flight arrangements – airlines each have their own rules for pet transport. That can include limits on the number of pets you can take with you at one time as well as overall limits on the number of pets in the cabin or in the hold. Rules can differ according to your pet’s size and weight or weather conditions. Waiting too long to make reservations could spell problems. IATA-approved carrier – if your pet will travel as baggage or cargo, they need a kennel that is neither too small nor too large by official standards. You will have to measure your dog. It’s important to understand that a number of airlines will not take snub-nose dogs and cats. And you may not import a Pit Bull Terrier, Japanese Tosa, Dogo Argentino or Fila Braziliero dog to anywhere in the United Kingdom. What you need to move a pet to London from the United States. Current rabies vaccination. Pets that are at least 16 weeks old must have their “primary” vaccination at least 21 days before travel. That means either this is the first time the animal has ever received the vaccine, or it’s the first vaccination since the animal was microchipped or the pet’s previous vaccination was too long ago to meet import requirements. International health certificate (USDA Form 7001), signed and certified by a USDA-accredited veterinarian. This is an official export document which confirms your pet is not ill or diseased and has met rabies vaccination and tapeworm treatment requirements. Be aware that USDA-APHIS occasionally changes this form – the last change was at the end of 2014 -- so be sure you are filling out the most up-to-date version. Tapeworm treatment – Dogs must undergo treatment for tapeworm (Echinococcus). The treatment can only be given 1-5 days before your pet will enter the UK, and the treatment date must be included on their International Health Certificate. These things have to be done in this order, to meet verification and timing requirements. Happily, there are no US pet export requirements. And there is no quarantine when your pets have the proper paperwork. Moving a pet to London from within the European Union. Thanks to the EU Pet Travel Scheme, dogs and cats can travel freely with their owners within EU countries, if they have a European pet passport issued by an authorized vet. This validates your pet’s rabies vaccination status. However, even within the EU, dogs must undergo the same tapeworm treatment described above, with the date certified on their EU pet passport. If you’re moving from someplace other than the EU or an “approved country,” your pet will need a blood test at least 30 days after they received their rabies vaccination, then there is a 3-month waiting period. At that point, if the blood sample confirms your pet’s rabies vaccination is working properly, you will be free to head to London. Unless you plan to move a pet to London from the Republic of Ireland, you are required to use an approved transport company as well as an approved route. You will come to appreciate this requirement. 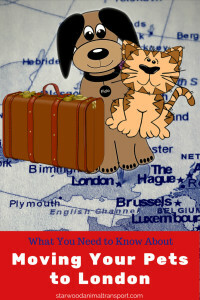 Learn more about moving your pet to the United Kingdom. Tally ho!